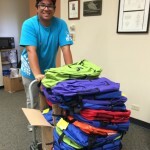 Over 100 vulnerable children will go to school this month carrying new backpacks filled with school supplies, thanks to a recent donation from the Hawaii Association of Legal Administrators, one of the Kukui Center’s Community Partners. 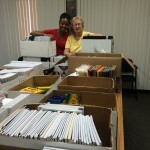 They have been collecting supplies all summer in order to get them to the KC agencies in time to distribute the backpacks so that the families can make sure that their kids can have a fresh start to the new school year. The legal administrators delivered boxes that were filled with crayons and pencils and pens and memo books, among other items. They made sure to provide enough supplies and backpacks so that the students in kindergarten through twelfth grades would get what they need. This entry was posted by Marlene Among on August 6, 2014 at 11:24 pm, and is filed under Events. Follow any responses to this post through RSS 2.0.Both comments and pings are currently closed.